Rachel Hartzler, 7, takes a minute in between session of playing tag behind the Sugar Tree Country Store on Saturday, March 8, 2014, during the Highland County Maple Festival in McDowell, Va. The families of the children were at the country store to sell maple ice cream and maple chicken as a part of the festival. 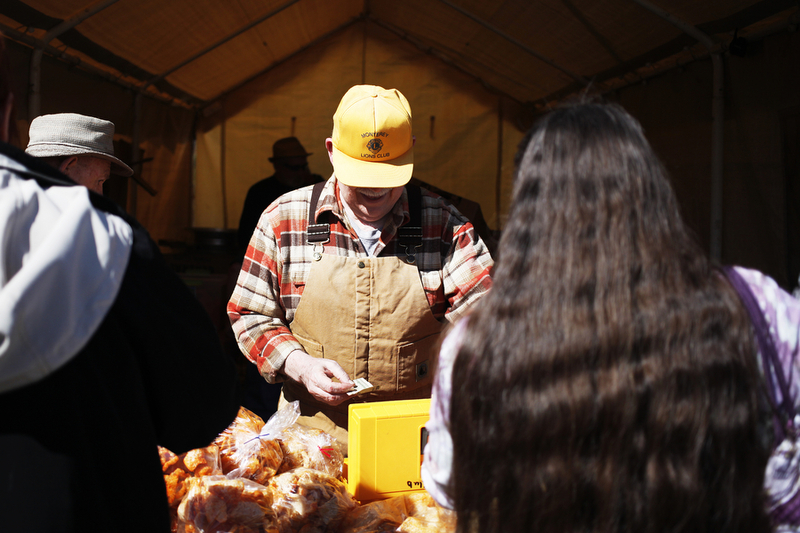 The Highland Maple Festival is one of the best events in this area of Virginia. If you like food, or beautiful scenery, or are a human being, it's the greatest. I decided to feast like crazy while I was there this year and indulged in maple-glazed chicken, buckwheat pancakes and, of course, the infamous warm, doughy maple donuts. One of my photographs was also featured on a project by Roger May called Looking at Appalachia. It's a wonderful project looking to create a more encompassing and accurate depiction of the Appalachian area, as most of the images from the area were taken 50 years ago during a "War on Poverty" campaign commissioned by LBJ. I think it's a wonderful project and can't way to see the other crowdsourced images that come out of it. Ron and Kay Sommers of Fishersville look into tapped sap pails at Rexrode's Sugar Orchard on Saturday, March 8, 2014, during the Highland County Maple Festival in Monterey, Va.
Bill Ellenburg sells pork rinds with the Monterey Lions Club on Saturday, March 8, 2014, in front of the Highland County Public Schools during the Maple Festival in Monterey, Va.
Fred Frye fries pork rinds with the Monterey Lions Club on Saturday, March 8, 2014, during the Highland County Maple Festival in Monterey, Va.
Todd Frye and Randy Richardson coat pork rinds in barbecue powder with the Monterey Lions Club on Saturday, March 8, 2014, during the Highland County Maple Festival in Monterey, Va. Patrons wait in line for the craft fair during the Highland County Maple Festival on Saturday, March 8, 2014, inside Highland County Public Schools in Monterey, Va.
Festival-goers eat buckwheat cakes and pancakes at the Blue Grass Ruritan Club on Saturday, March 8, 2014, during the Highland County Maple Festival in Blue Grass. The festival opened with sunny, 50-degree weather and will continue March 9 and March 15-16. George Taylor explains the syrup process to visitors at Rexrode's Sugar Orchard on Saturday, March 8, 2014, during the Highland County Maple Festival in Monterey. The festival opened with sunny, 50-degree weather and will continue March 9 and March 15-16. Jennifer Hartzler, 9, runs as she plays tag with friends and siblings behind the Sugar Tree Country Store on Saturday, March 8, 2014, during the Highland County Maple Festival in McDowell, Va. The families of the children were at the country store to sell maple ice cream and maple chicken as a part of the festival. 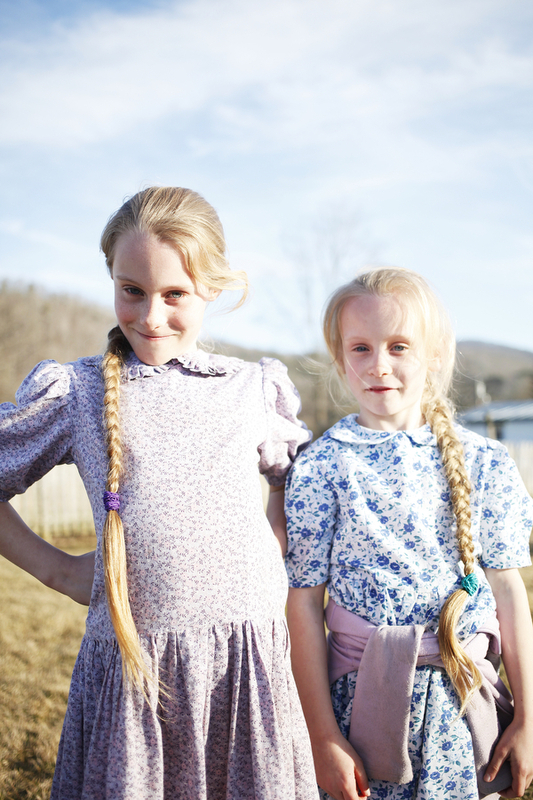 Sisters Jennifer, 9, and Rachel Hartzler, 7, behind the Sugar Tree Country Store on Saturday, March 8, 2014, during the Highland County Maple Festival in McDowell, Va. The two said they have never cut their hair.